Back in Febuary we had the chance to provide PA equipment for the budding festival, Big Winter Classic. By coincedince, Mike, Duncan, and myself had the opportunity to tech at several of the stages throughout the weekend. 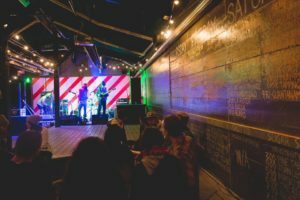 The festival is centred around the idea of melding the craft beer and local music scene in Calgary, and what better venue could there be than the neighbouring Last Best Brewing & Distilling and Broken City establishments. 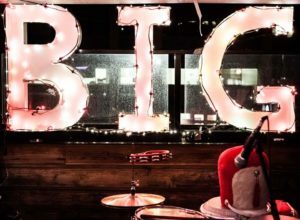 Taking place over the course of three days (January 28, 29, and 30), the festival served as a testament to Calgary’s bustling local music & brewing scene, and fun times were had by all. 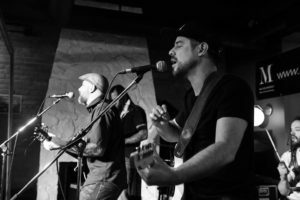 Graced by the likes of Guantanamo Baywatch, Highkicks, Lab Coast, The Mounties, and many more, the “Albeerta” stage was a sight to behold. Armed with our Myer dual 18″ Subwoofers and QSC KW153 towers, the PA served well in reinforcing the eclectic energy eminating from the stage. Our Midas M32R digital console worked like a charm for each tech running sound for the three days. Moving around proved difficult, as not an inch on the Last Best Patio was free at the height of each evening. Due to the volume of the audience and the volume of the music, in the future we will most likely add more to the FOH system in order to ensure the clearest sound reinforcement possible. Just remember to bring your hearing protection! The indoor “Fireside” stage, directly adjacent to the “Albeerta” stage was another spectacle of epic proportions. With performances from Meisha Louie, Northwest Passage, Burro and many more including a suprise performance from Michael Bernard Fitzgerald, there was no difficulty in keeping a full audience at this stage as well. We amplified the sound using a pair of QSC KW181 subwoofers with KW122 loudspeakers mounted on poles, passing through our Presonus Studiolive 24.4.2 digital console. The stage was adorned with a large picture frame hung in front, giving the aesthetic of looking at a moving picture with music within. Cask tappings at each stage throughout the weekend, an excellent lineup of local music, and a great community to appreciate it come together to form a unique experience for anyone who wishes to become better acquainted with what is going on in this city. We were very happy to be a part of it and hope to do it again next year.